FTC Disclosure: Thank you to partner St. Martin's Press and author Sally Hepworth for an early copy of this book which I received via Netgalley. The best description I can provide as an introduction to this book is to tell you that the Family Next Door holds a candle to The Husband's Secret, a story I read and loved. This book held my attention, and I was intrigued to finish the book and find out how all the pieces of the puzzle finally came together. Once I was finished, I sat to parse out the story and share my thoughts. Essie's story was a bit unsettling, and by the end I was surprised at the turn that her plot line took. I didn't see the end with Barbara coming! Knowing the craziness a new mother can experience made sense, but there were many times that I felt the story was too far-fetched, even for fiction. Having been a mother myself, I can understand what that craziness can do to you, and could relate to Essie's post-partum error in judgment. She was the most likeable character in the entire book! Once Isabelle entered into the picture, my curiosity was piqued, and I was again surprised at the turn in the story line. 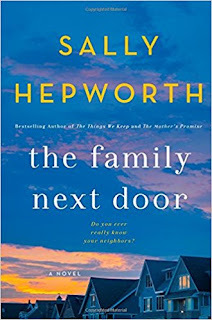 Sally Hepworth expertly wove in two other stories that were equally intriguing, and the stories of all of the neighbors and their relationships were ones that added to the book, and the reader's interest. As with many books I have recently read, there is always a neighbor or two whose life seems to good to be true, and things end up awful for them! 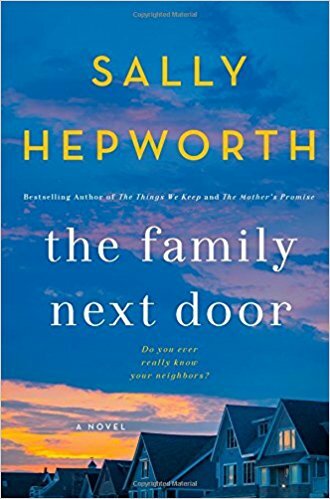 Fans of Liane Moriarty will enjoy Sally Hepworth's The Family Next Door.